We’ve been having a light dusting of snow every couple of days for the past week or two. While it’s pretty, couldn’t it snow enough to give us a two hour delay or a day off? Everyone keeps getting their hopes up for nothing! So, when the weather is kind of icky, what better time is it to make cupcakes? Especially sunny, lemony ones. 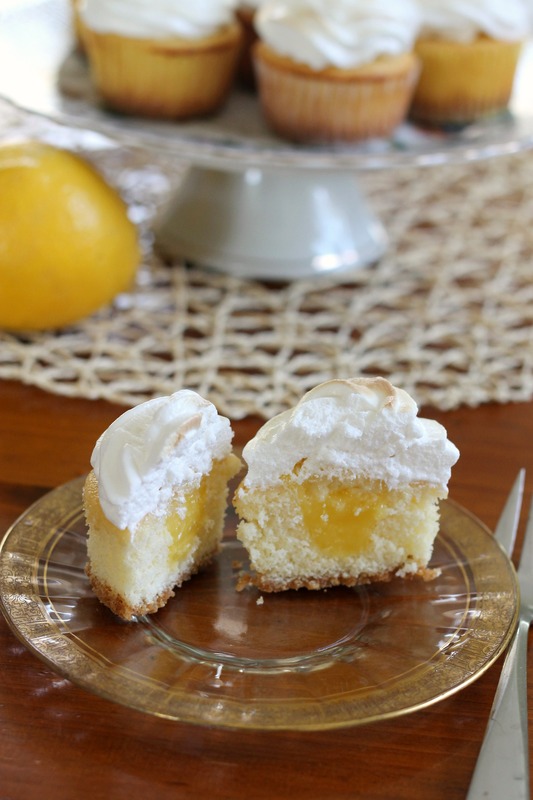 Celine had a burst of inspiration for them when one of our teachers randomly mentioned lemon meringue pie last week. While we found out through Google that is has been done before, we were pretty excited about the idea anyway. These cupcakes start out with a faintly lemon graham cracker crust that is baked for a couple of minutes before adding the batter. For the cake part itself, we made a light but sturdy-enough-to-fill lemon cake. We then filled it with lemon curd (yum! ), and topped it off with a fluffy 7-minute frosting. 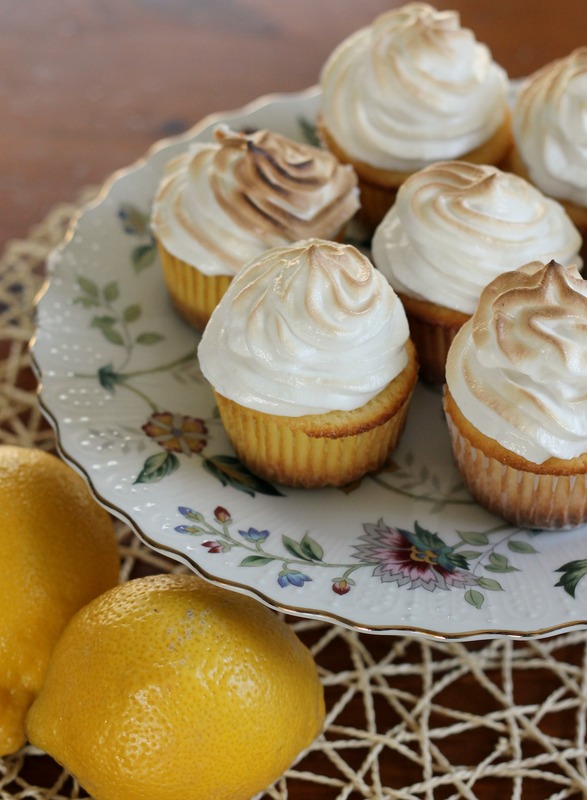 For the “icing on the cake,” we put them under the broiler for a minute to give them a brown top, just like classic lemon meringue pie. What resulted was one of our favorite cupcakes ever. 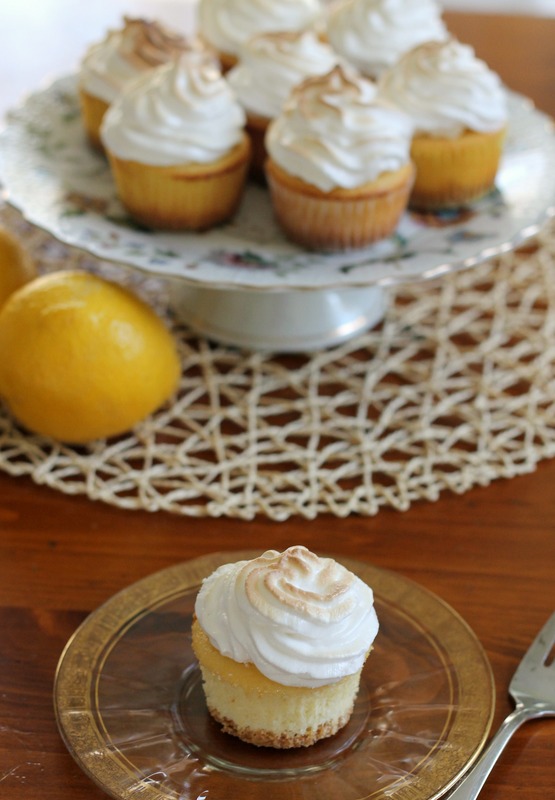 They tasted exactly like lemon meringue pie in cupcake form. Our family ate them surprisingly quickly, and they were even our lunch on one day (hey, you can’t eat cupcakes and lunch all in one sitting!). One thing to note is that this recipe makes a quite a few cupcakes. Since the frosting is best freshly made, and loses its silky texture after about a day, we would recommend halving the batch of cupcakes if you don’t plan on serving them all within a day. Wash the lemons and zest them (only the outer colored part- not the white) into a bowl. Make sure you have two teaspoons of zest and set aside. Slice the citrus in half crosswise using a sharp knife, and extract as much of the juice as you can using citrus juicer. Juice until you have 2/3 cup of juice. Make sure to strain it! Create a double boiler by filling a saucepan with 1 inch of water, then placing a metal bowl on top of the saucepan. Make sure the bottom of the bowl does not touch the water, and then remove the bowl. Whisk the juice, whole eggs, egg yolks and sugar in the metal bowl until smooth. Add the butter cubes to the bowl, but do not stir. Heat the water in the saucepan over low heat until it simmers (not boils) and place the bowl atop the rim. Stirring gently and constantly using wooden spoon, cook until the curd has thickened and all of the butter has melted and is incorporated, about 10 minutes (it took us a little longer). It should coat the back of a spoon. To be on the safe side, we used our instant-read thermometer to make sure it was 165 degrees. Strain the curd over a bowl using a fine-mesh sieve and then stir in the zest. Cover with plastic wrap pressed directly against the curd to prevent a skin from forming and chill for at least 3 hours or overnight. It will thicken as it chills. Preheat the oven to 350° F, and line pans with cupcake liners. In a small mixing bowl, combine the graham cracker crumbs, sugar and melted butter; mix well with a fork. Drop about 1 tablespoon of the graham cracker mixture in the bottom of each cupcake liner and press down to line the bottom. You can use either your hands or a small cup for this job. Bake for 5 minutes. Remove from the oven. Keep the oven temperature at 350° F.
In a medium mixing bowl, combine the cake flour, baking powder and salt. Whisk together and set aside. Put the butter in the bowl of an electric mixer fitted with the paddle attachment. Add the lemon zest to the bowl of the mixer with the butter. Beat on medium-high speed for 3 minutes, until light and creamy in color. Scrape down the sides of the bowl and beat for one more minute. Add the sugar to the butter mixture, ¼ cup at a time, beating 1 minute after each addition. Mix in the eggs one at a time until fully mixed in. Scrape down the sides of the bowl after each addition. Combine the buttermilk and the lemon and vanilla extract in a liquid measuring cup. With the mixer on low speed, add the dry ingredients alternately with the wet ingredients, beginning and ending with the dry ingredients and mixing just until combined. Scrape down the sides of the bowl and mix for 15 seconds longer. Divide the batter between the prepared cupcake wells. Bake (rotating the pans halfway through) until light golden brown and a toothpick inserted in the center comes out clean, about 20-25 minutes. Let cool in the pans for a few minutes, then remove from tins and let cool on a wire rack. Combine 1 1/2 cups sugar with the water and corn syrup in a small saucepan. Bring to a boil over medium heat, stirring occasionally, until the sugar dissolves. Continue boiling without stirring until the syrup reaches 230 °F. Meanwhile, in the bowl of a stand mixer fitted with the whisk attachment, whisk the egg whites on medium-high speed until soft peaks form. With the mixer running, add the remaining 2 tablespoons sugar, beating to combine. As soon as the syrup reaches 230 °F, remove from heat. With the mixer on medium-low speed, pour syrup down the side of the bowl in a slow, steady stream. Raise speed to medium-high; whisk until the mixture is completely cool (you can test this by touching the side of the bowl) and stiff (not dry) peaks form, about 7 minutes. Using a small knife, cut a cone out of each cupcake. Cut the tip off each cone so that you have a small “disc” of cake. Fill each cone-shaped hole with lemon curd, and cover with the cake disc. Pipe the frosting on the cupcakes using a star tip. Turn on the broiler to high. Place about 6-8 cupcakes at a time on a baking sheet and broil for 30 seconds to a minute. The first batch will take the longest; subsequent batches will brown extremely quickly. Watch carefully, because you don’t want burned cupcakes! Alternately, you may use a kitchen torch. Serve immediately (they can be refrigerated, but they are best fresh). Enjoy!